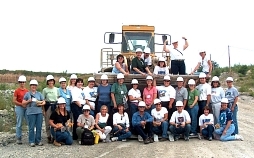 Teachers on tour at the Hunt Midwest Randolph Mine. Teachers ready to begin the LaFarge Underground Tour. Chris Upp, Workshop Staff, teaching the basics of making concrete. 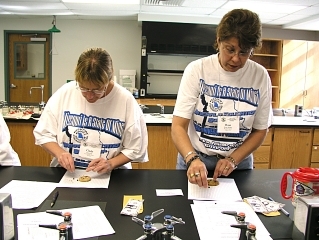 From Permitting to Reclamation: Teachers learing the basics of mining in the Chocolate Chip Cookie Mining Class. 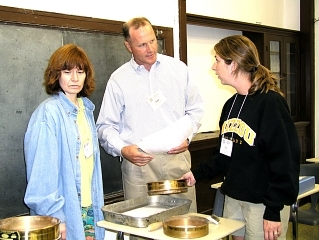 John Griesemer, Workshop Staff, explaining the methodology of material sizing and screening. Teachers making toothpaste for mined materials. I had so much fun and learned so much that I am speechless! Thank you so much for a wonderful workshop!! By far the best workshop I have ever attended! Great food, loved the door prizes, music, give-a-ways, speakers, staff, etc. etc.!!! The entire week has been incredible! I only wish I could share the knowledge of every person or staff member of this workshop with my students, your teamwork is how the world should function! Thanks for all your dedication and hard work! This is one of the best workshops I have ever attended. Thank you for a terrific job! The teaching materials provided were quite friendly! Thank You! Great Job! Great Time! Lots of useful materials! 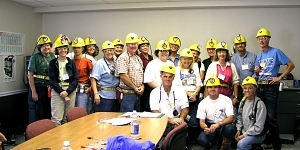 The workshop format provided allowed me to understand the entire mining process. All the tour guides were very knowledgeable and helpful. Everyone was eager to share their business with us. Seeing the blast at Hunt Midwest firsthand was too cool! You exceeded my expectations far and beyond anything I could have asked for- and that doesn’t even begin to count the give-a-ways! The food was great! The prizes were unbelievable! Loved the mine tour and the cement plant tour! The scholarships were tremendous! The dinners and karaoke were such fun and so generous. Everyone did a great job! I have never been to a conference where the staff has put their time, knowledge, effort and most important, heart into a workshop. I have learned so much about this industry. I can’t wait to share all that I have learned with my students, family and community. Thanks to all and God Bless!